Until this beauty of a blazer came into the picture I was baron on the black blazer front. I do consider myself a bit of a blazer-aholic so I even find it shocking that my black blazer collection is/was lacking. Thankfully I have added this unique black beauty to my collection. I mean, how can I not stop twirling while wearing it?? 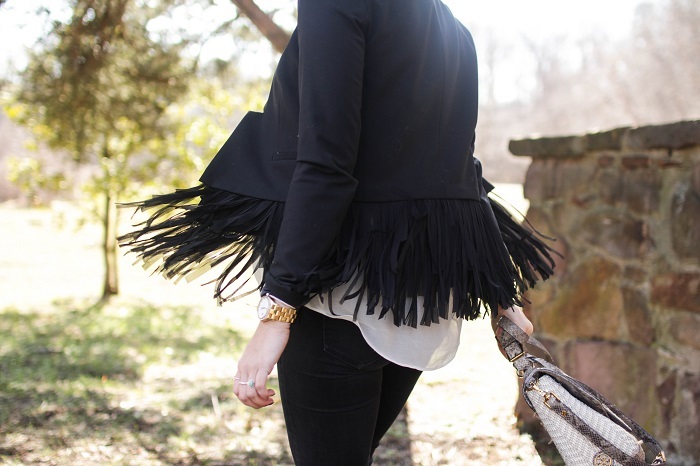 Omg that fringe blazer is such a great find! It looks awesome!! So chic! Oh hey girl! I tried this blazer on and still regret not buying it. Looks fab on you! I'm loving anything with fringes at the moment! I would love it if you could stop by my blog and add this post to my fashion blogger link up. I think my readers would really like your style.